Dubai,UAE,October 25, 2018 – Samsung Gulf Electronics and Dubai’s Roads and Transport Authority (RTA) will mark the 9th annual Public Transport Day with exciting competitions. Starting on October 26 until 31 before the Public Transport Day on November 1, Samsung is organizing two fun contests for UAE commuters. Prizes include 100 units of Samsung Level U pro and a chance to have your sketch featured on Dubai’s ‘nol’ transportation smart card. The integrated array of mass transit means in Dubai, which covers the metro, tram, public buses and water transport means, has become a key component of people’s mobility in various parts of the city. Dubai’s RTA organizes Public Transport Day on November 1 each year to highlight the role of the Emirate in supporting efforts towards improving the environment, achieving sustainable development, encouraging residents to use mass transit means, and improving passenger levels. 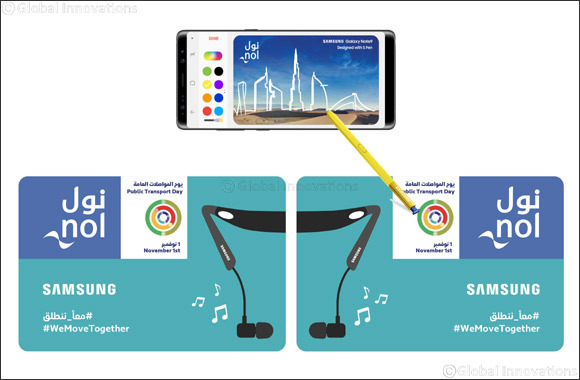 A matching game where ‘nol’ cards would have half an image of the Samsung Level U pro - find the ‘nol’ card which complete your half and both commuters win a Samsung Level U pro each. Commuters are invited to draw a sketch about Dubai, using the S Pen on a Samsung Galaxy Note9. Winning entries will be featured on a limited edition ‘nol’ card. To participate, drop by the Samsung stand at Burjuman metro station and Financial Centre metro station from October 26 to 31, RTA headquarters from October 25 to 31, and Samsung brand shops at Mall of the Emirates, Deira City Centre and Ibn Battuta mall. Participants who own a Samsung Galaxy Note9 can create sketches using S Pen and submit them through email withgalaxy@samsung.com or send it to @SamsungGulf on Facebook or Twitter. Winner with the most creative sketch will be announced on Public Transport Day.